Holy basil or Tulsi has medicinal properties. The leaves are used in Thailand for sharpen memory. The leaves of holy basil are used during the rainy season, when malaria and dengue fever are widely prevalent. The tender leaves are boiled with black tea, to use as a preventive against theses diseases. A tea is also made from the leaves, and raw honey is added with fresh ginger as an effective remedy for bronchitis, asthma, influenza, cough and cold. These little green leaves can also reduce blood cholesterol. Holy basil is also used as an anti-stress remedy. Recent studies have shown that chewing 12 leaves of holy basil basil, twice a day, can help to fight stress. Cook 1 cup of your favorite rice according to package instructions (use chicken broth in place of water, provides more flavor for the dish). 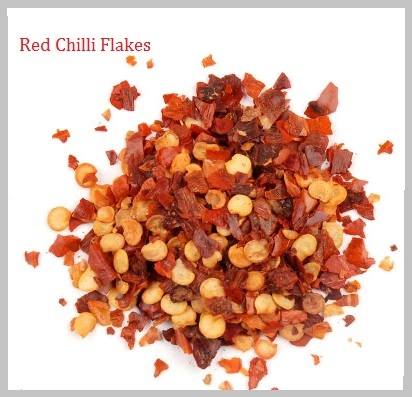 Red chili is a great source of beta-carotene, which is converted to vitamin-A to sponge cell damaging free radicals. The chili also helps reduce inflammation and reduces blood clotting. Heat a wok (or similar pan) over medium heat. Add oil and garlic, stir-fry for a few seconds or until you smell the aroma of the garlic. Turn up the heat to medium-high. Next add the chicken, chilli flakes, half of the basil, and stir-fry for 1 minute. Now add the fish sauce, raw sugar, and stock. Mix in well. Stir-fry until chicken is oblique. Turn the heat to low, and add the rest of the basil. Stir-fry the contents of the wok or pan 30 seconds to 1 minute. 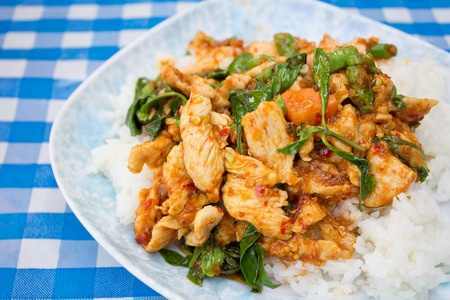 Plate some rice and spoon on top some Stir-Fried Chicken with Holy Basil and enjoy. This entry was posted in Chicken, Cuisines of the World, Main Dish and tagged Basil, Brazil, dengue fever, Dengue virus, Ebola virus disease, Florida Keys, General Motors, holy basil, Oxitec, Raw Honey, red chili flakes, stir fry. Bookmark the permalink.